Only playable with the basic game Kingdom Builder. The third Kingdom Builder expansion posts new challenges for the players. New bonus actions that players acquire once they take two of the same location tile give them even more possibilities to shape their Kingdom the way they want. The swamps, a new terrain, hold more ways to place your settlements once you draw the new terrain cards. Six Kingdom Builder cards make the chase for Gold even more exciting and interesting. 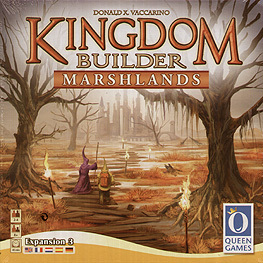 All Kingdom Builder expansions may be combined with the basic game, and in any combination.